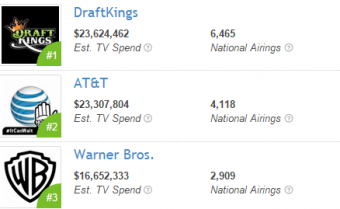 Another first for DraftKings in the daily fantasy marketplace, as they became the top television advertising spenders across all industries for the period September 1st-7th. With 6465 national airings of their commercials, they spent an estimated $23.5 million dollars to take the top crown away from AT&T, who had held the position during August. This increased spending has also brought about an increase in the quality of the commercial DraftKings offers. You may have recognized that voice gracing your airwaves this week as none other than actor Ed Norton, who has signed on to do the voice overs for the new ad campaign. Only time will tell if this massive outlay on advertising will affect DraftKings bottom line in a positive or negative fashion. The investment in advertising, coupled with DraftKings guaranteeing a $10 million dollar prize pool for a single contest during Week 1 of the NFL Season, leads me to believe they’re operating under a ‘Field of Dreams’ mantra of “If you build it, they will come”. Many within the upper ranks of the company believe in the product they’re offering, and further believe that they will be able to recoup this investment many times over. If not, then they’ve blown through a significant portion of their latest round of fund-raising, a situation which may deter future investors. DraftKings appears to be executing an all in shove for dominance of the daily fantasy industry. While on the surface it may appear that they have succeeded, FanDuel and all other operators are bound to see a trickle down effect as more and more people become educated about daily fantasy sports. Watching TV, you see a clear lack of entry into that advertising market by the other players. Perhaps they’re taking a wait and see approach, while letting DraftKings inform everyone about the lure of daily fantasy sports. Again, time will tell.